"By using a few clever cooking tips and top quality ingredients, anyone can make firm (not runny) really tasty mashed potatoes to die for...I am always asked to please bring my potatoes, or to tell why my potatoes taste like potatoes with so much flavor. Now my secrets belong to you also. Hugs, and enjoy! Be prepared for compliments :>)"
Pour water into a saucepan. Place a large steamer basket into the saucepan over (not touching) the water, and place the potatoes into the basket. Bring the water to a boil. Reduce heat to a simmer, cover the pan and basket with a lid, and steam potatoes until tender in the center, about 20 minutes. A skewer inserted into a potato should easily pierce the center. Using tongs to hold hot potatoes, peel them, and set aside. Reserve potato cooking water. Place 1 cup of cream and the butter into the work bowl of a large stand mixer fitted with mixing paddle, and start the machine on low speed. Mix until the cream and butter are blended; add potatoes, and beat until thoroughly mixed. As potatoes mash, gradually pour in remaining cup of cream. If potatoes are too stiff, beat in reserved potato cooking water, 1 tablespoon at a time. If potatoes are too runny, beat in instant mashed potato flakes, 1 tablespoon at a time, until you reach desired consistency. Season to taste with salt and white pepper. 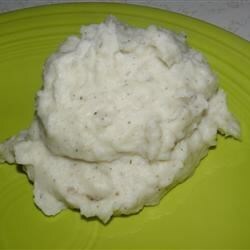 See how to make fluffy mashed potatoes that are, well, simply the best! Could be worse. It just didn't have any bacon in it. That was a downer. This is a very good basic mashed potato recipe. I left out the instant potato flake.The results was a creamy tasty mashed potato dish. Comfort food at its best. Very tasty. We all loved it. Simply delicious. I love this flavor!! The whole family raved over this for thanksgiving! I will make my mashed potatoes using this recipe from now on.